Zig Ziglar wrote that “the leader and the manager must communicate effectively and regularly so all the people understand the support each supplies to the other.” In this, Zig Ziglar was most likely referring to the boss as “manager” and the “leader” as the founder, owner or visionary of the business. Every small business owner needs to decide if he or she is going to be a boss or a leader. But what is the difference and why is it important? Leaders are people who are responsible for inspiring, guiding and leading a group of other people on a path to grow a business. A boss is a person who takes charge of the workplace. Businesses run by bosses tend to have higher employee turnover. While a leader can be a boss, not every boss is a leader. Although leaders and bosses have nearly identical definitions, they are very different in today’s competitive small business world. Even the word “leader” sounds more positive than the word “boss.” Yet it is very interesting that when people dream of obtaining a higher positions in life (whether it be in business or in politics) they seem to dream more about being bosses than leaders. Acording to Merriam-Webster.com the Definition of BOSS is: A person who exercises control or authority, specifically, one who directs or supervises workers. Merriam-Webster defines a LEADER as a person who has commanding authority or influence. 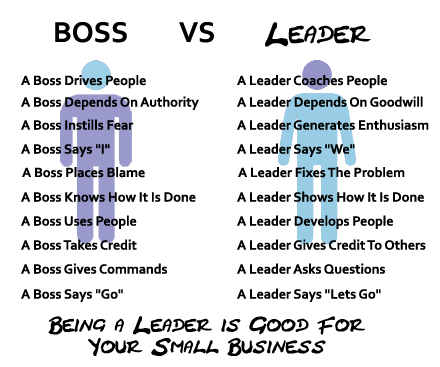 These two definitions are very similar, but when comparing bosses and leaders, the leaders are usually those who garner real respect through their example – while those who are bosses only demand respect through his or her position of authority. Bosses often just give orders, while leaders lead by example. Leaders are considered to be more effective compared to bosses, as they usually inspire more productivity. A leader is someone who is looked upon in an inspirational way and is followed blindly. Leader is also expected to listen to the people they lead and work together with those they lead. But it is also important to note that a boss could be a leader and could also inspire his people, while listening to employee suggestions. A leader will often hire a person to be the boss (or manager) of the office – to take care of the day-to-day running of the business and the office space. But a true leader will also lead by example and not try to micromanage everything. They allow their bosses to administrate, while they maintain their vision and continue to grow the business. 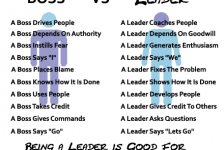 When it comes down to bottom-line comparisons between a boss and a leader, the leader inspires much greater productivity and success, which may often be thwarted by the driving, authoritarian nature of the boss. Small business employees that are being LED forward are much happier, more productive and more creative than those DRIVEN forward. The most successful entrepreneurs are a mix of both a leader and a boss. While sometimes only authority spurs action, it is best to ensure that bosses believe in their employees and lead them by inspiring them. A leader’s authority and power are in the hands of the people, while the boss’ authority is not. Even in a boardroom or a meeting room setting with employees, a leader will ask more questions than they will give answers to – while offering their own solutions to a problem. Good leaders want to learn as much as they want to teach. So, the best way for a modern leader to learn is by listening to those employees that he or she relies on to run their business.